Calling All Vets! How Professional Do Your Reports Look? How do you make reports today and are they hurting or helping your business? If you are using Pages or Word to make reports, you probably notice how difficult it is to brand your deliverables. In fact, not only that, but the end product doesn’t particularly look that professional. It’s because with the above solutions, you cannot create, edit, and manage your templates with ease and efficiency. We have spoken to many Horos users that have admitted to using templates provided to them by veterinary conferences. While having access to these templates might seem like a breath of fresh air, don’t forget that you still don’t have much flexibility in making that template your own. You have to work with what you get. Now, if you are a private practice or a self-owned business, you already know that being able to promote and market your brand is critical to your success. That means when you send a report to a referring physician, you want it to be a reflection of your professionalism. Overall, you want to leave your audience with a lasting impression. You might not be a marketer, but that doesn’t mean that you should not branding your reports. That’s actually one of the best ways that you can advertise your brand. With software like Pages or Word, this can be a tedious and sloppy process. However, with Horos Cloud Reporting, it is made relatively easy. 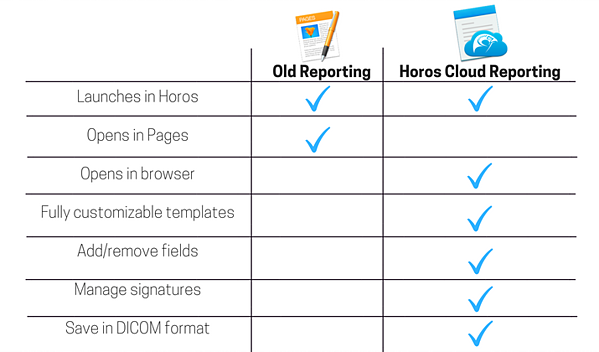 The table below shows some of the big differences between using a platform like Word or Pages to create reports, versus using Horos Cloud Reporting. You’ll notice that with the Cloud option, you have tremendous flexibility with how your end result looks like. Unlike before, you can now not only add and remove multiple fields, but you can also save your reports as DICOM files and brand your reports true to your business. Veterinary reports should never look like a high school project put together in a rush. Unfortunately, with solutions like Word and Pages, no matter how hard you try, reports just don’t look that impressive. With all the time you spend trying to adjust margins and reassemble your data for each patient, you could be breezing through numerous reports in the Cloud. That’s what Horos Cloud Reporting is all about. With your first month free, followed by a $1.99 monthly subscription you can create and edit solid templates anytime, anywhere so long as you can login to your account. So, what are you waiting for? Start making professional looking and impressively branded reports today and start promoting your practice like never before.